Sprinkle shrimp with sugar and salt. Combine chili powder, cumin, coriander, and oregano. 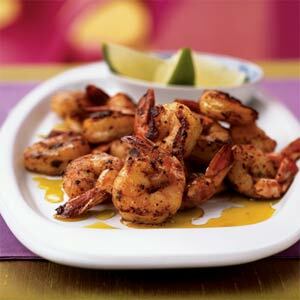 Lightly coat shrimp with spice mixture. Heat 2 tablespoons of Avocado oil in a large nonstick skillet over medium-high heat. Add all the shrimp; sauté 4 minutes or until done. Place shrimp on a platter; drizzle remaining Avocado oil over shrimp. Serve with lime wedges and enjoy! !